Invisalign is a more subtle way of straightening your teeth. By using clear, custom-made retainers, your teeth can be aligned without traditional metal braces. Dr. Stephenson is a trained Invisalign dentist in Bend, Oregon. 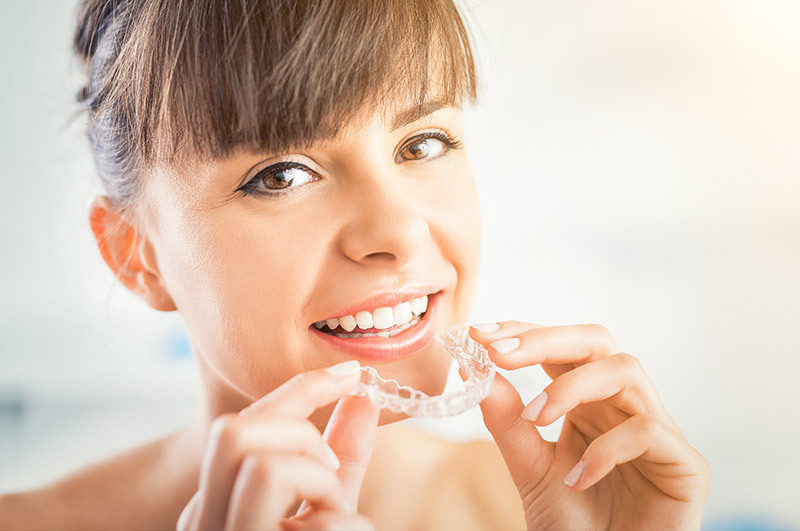 If you want to improve the appearance of your smile and bite without the use of braces or surgery, Invisalign might be the option you are looking for. If you think Invisalign is right for you, you will meet with Dr. Stephenson where he will first explain the alignment process. Next, he will take a 3D digital scan of your teeth to send to Invisalign. You will return to Juniper Dental for check-ups every six to eight weeks in order to get the most accurate digital data on your smile. Invisalign will create custom aligners that fit on your teeth. They are clear, plastic retainers, with fasteners if necessary, that you will wear for at least 20 to 22 hours every day and must keep clean. As a trained Invisalign dentist, Dr. Stephenson will know what treatment plan is best for you. He will go over the process and payment plan, so you’ll know exactly what to expect. Invisalign could be your way to a straight, bright smile, a smile that finally fits you. Call to set up a consultation with Juniper Dental today.